Perhaps it has something to do with being an artist and studying color theory throughout high school and college or maybe it has nothing to do with it at all. Either way, I admit I am quite peculiar when it comes to colors. I am fond of neutrals, love to experiment with bold hues, don't care much for black, and love unique vintage shades such as chartreuse. Chartreuse is like a pea green, a color halfway between yellow and green. I love it because you don't see it very often. 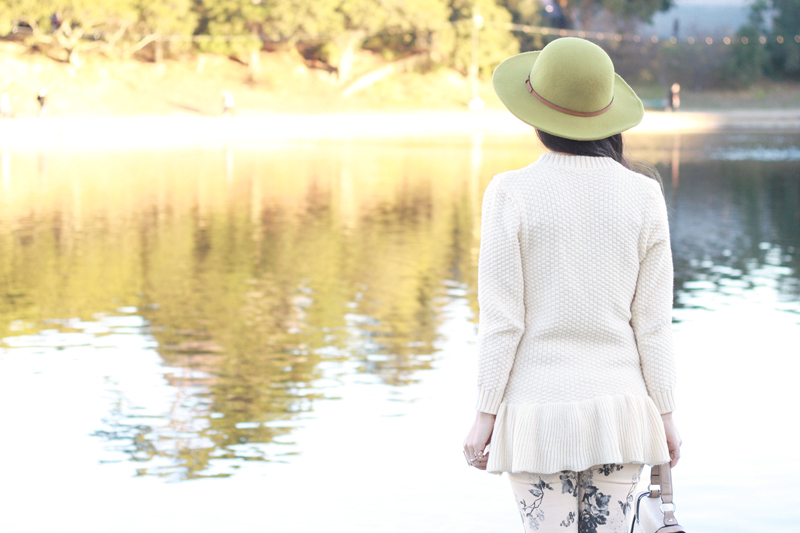 With that said, when I saw this chartreuse hat I was thrilled and seriously planned my entire outfit around it! 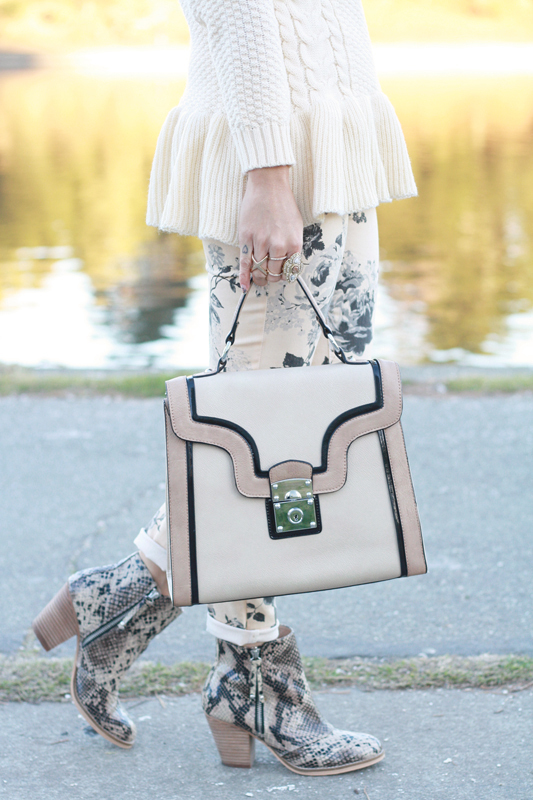 A lovely cable knit peplum sweater, faux fur coat, floral denim, snake print booties, and a structured satchel... monochromatically playing with patterns and textures. 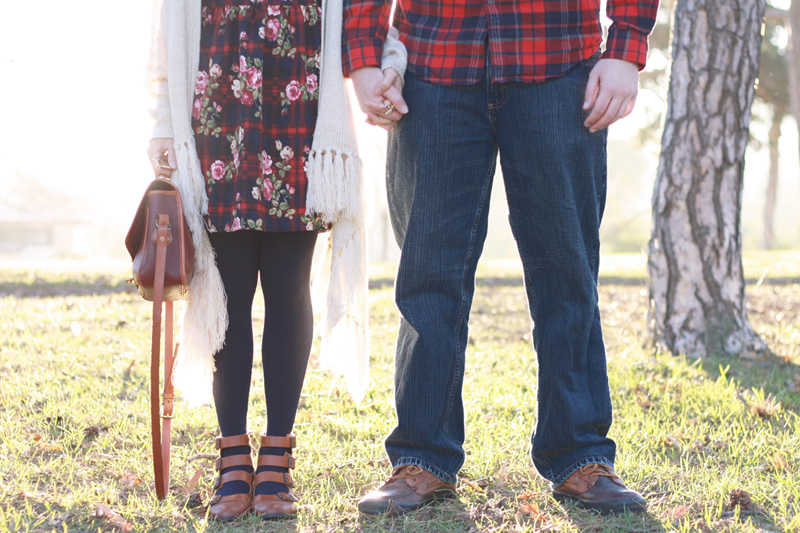 Well, this is the last outfit post for 2013! Thank you everyone for your support and see you all in the new year!!! 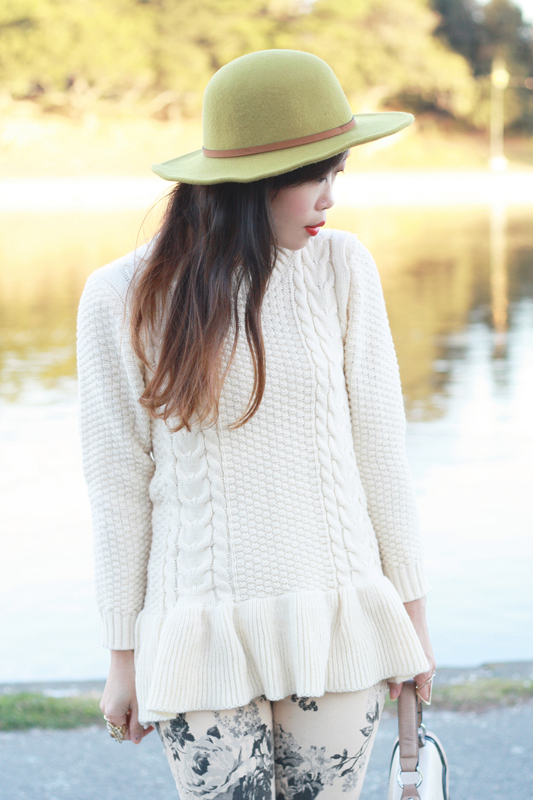 Cable knit peplum sweater c/o TBDress. 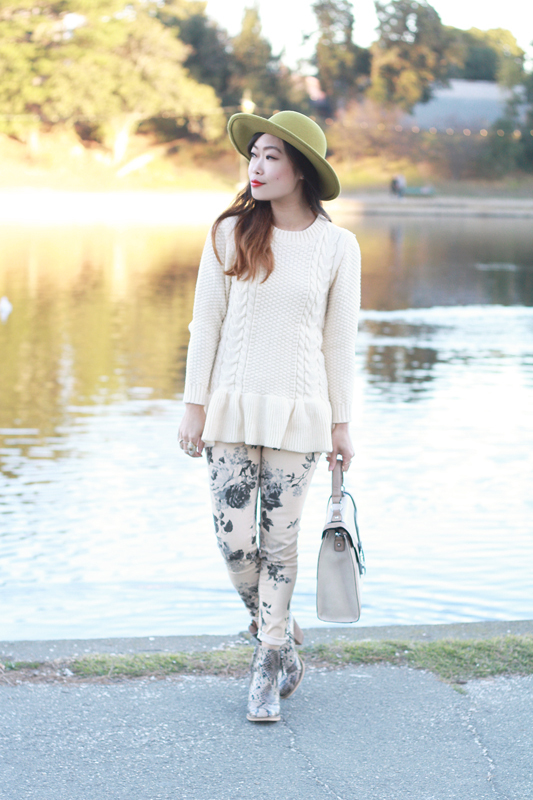 Floral denim by Sneak Peek. 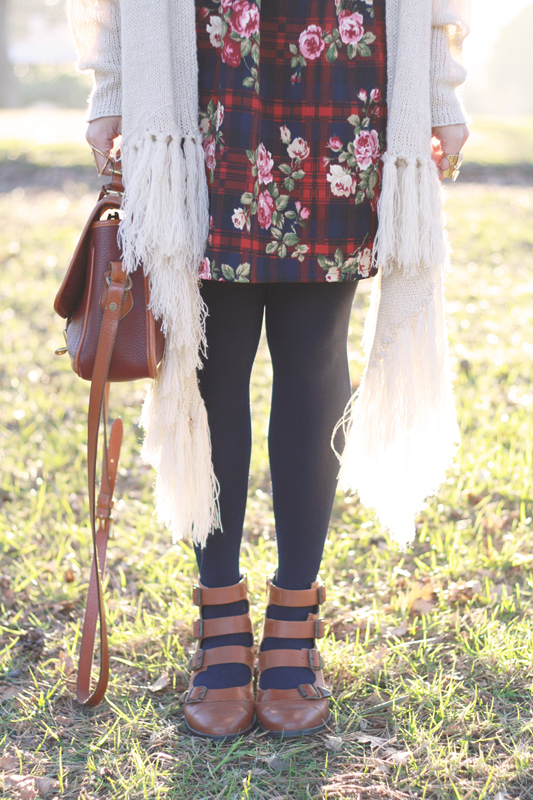 Faux fur coat from Japan. 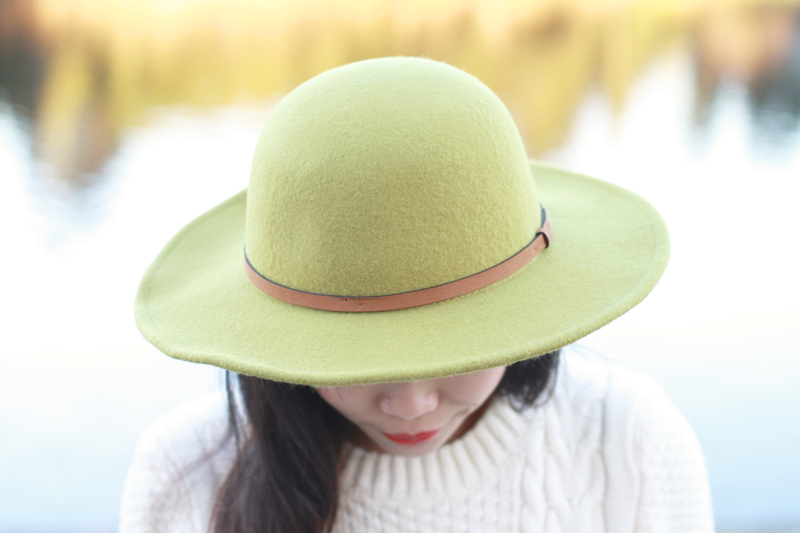 Chartreuse hat by RVCA c/o Lulu's. 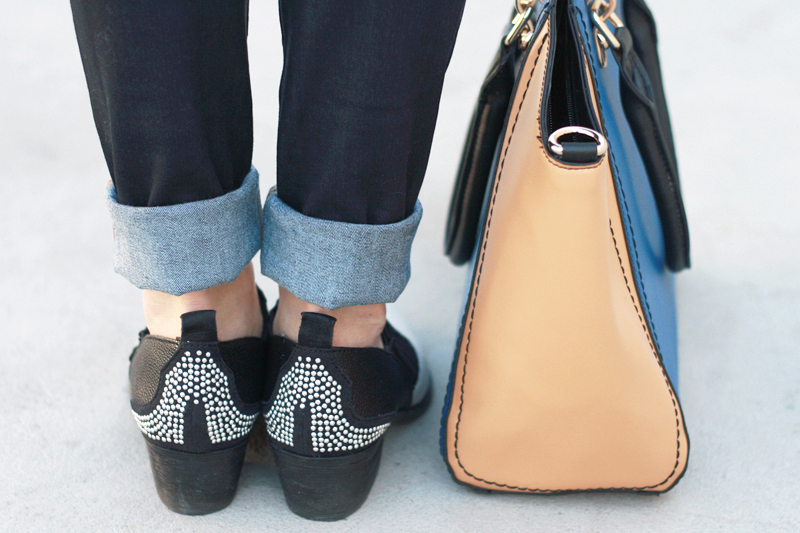 Keira bag by Melie Bianco. 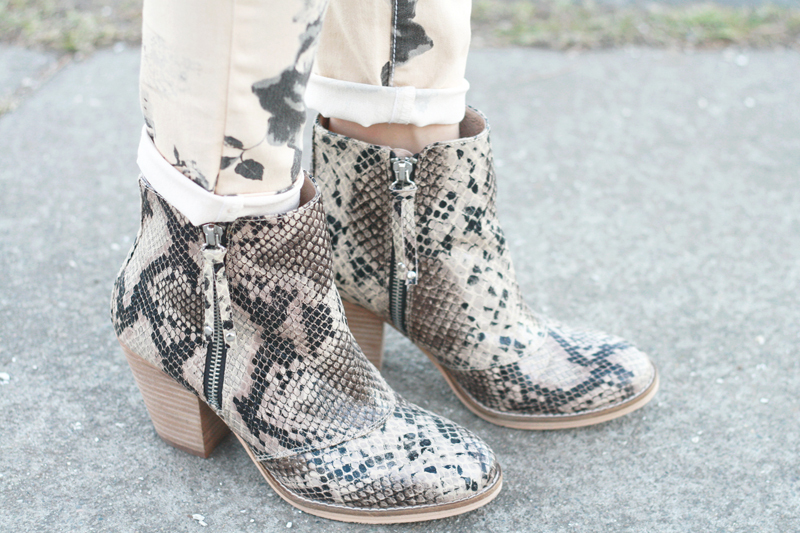 Snake print booties by Chelsea Crew. 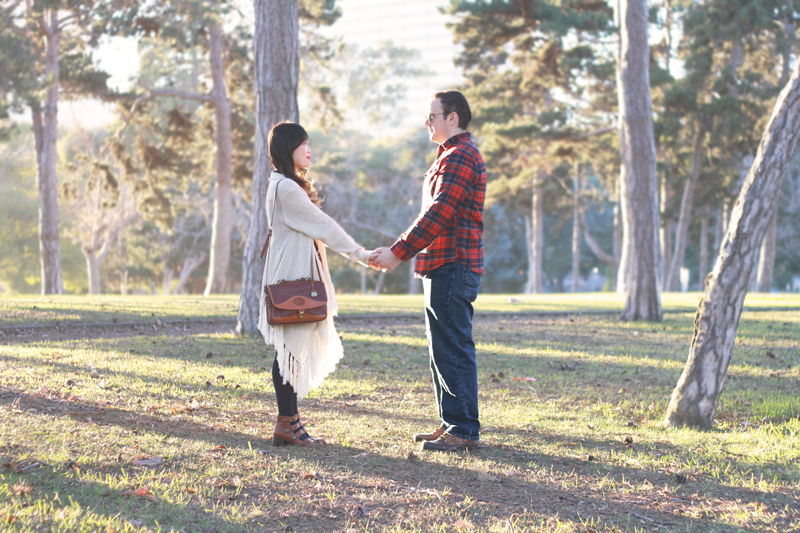 I have always wanted to do a his and hers type of post and I couldn't think of a better time to do it until now. The holiday is about being with loved ones, not to mention it is the only time of the year that is okay to wear cheesy matching outfits. 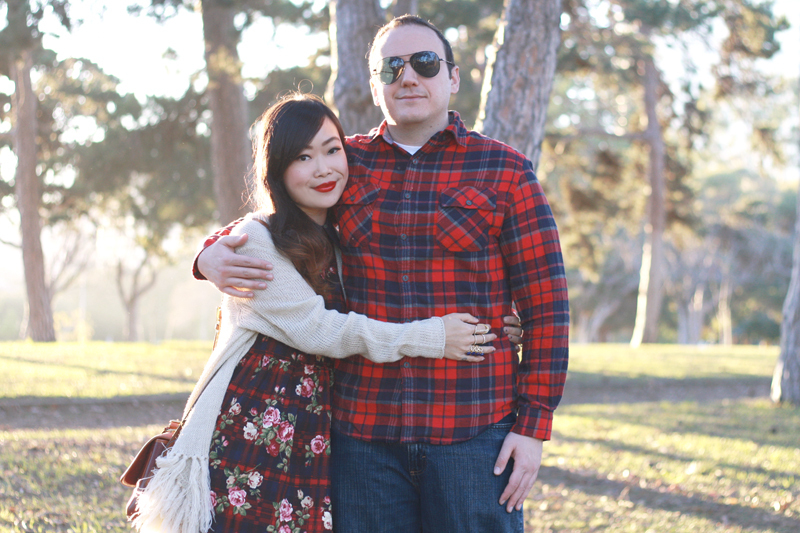 This is what my fiancé Chris and I wore on Christmas Eve. 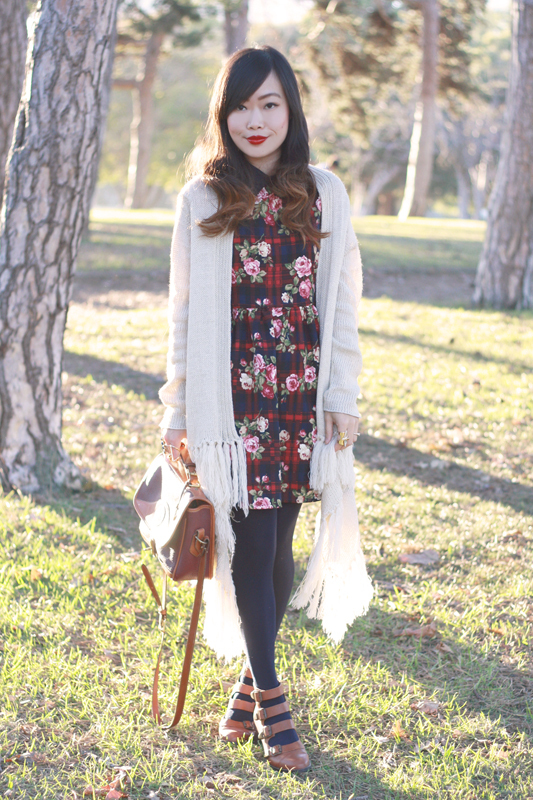 I have had this adorable dress for awhile but saved it to wear for the holiday. 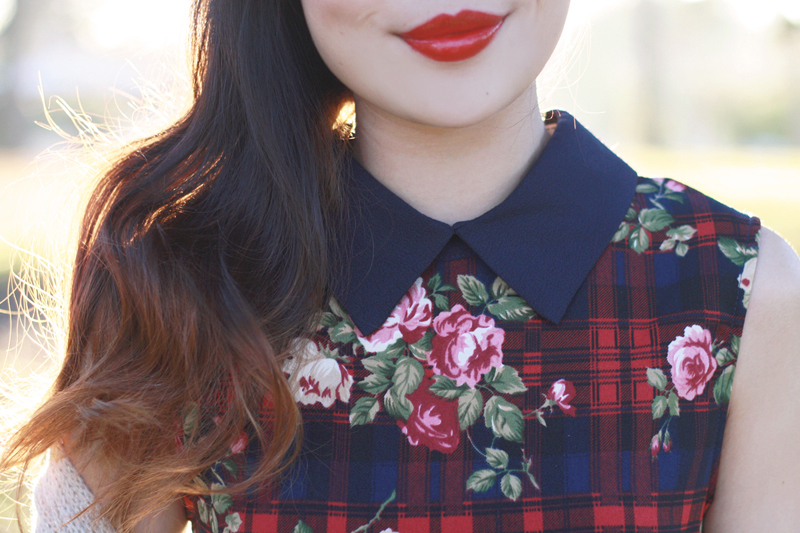 I mean, what's better than plaid, floral, and a collar combined? 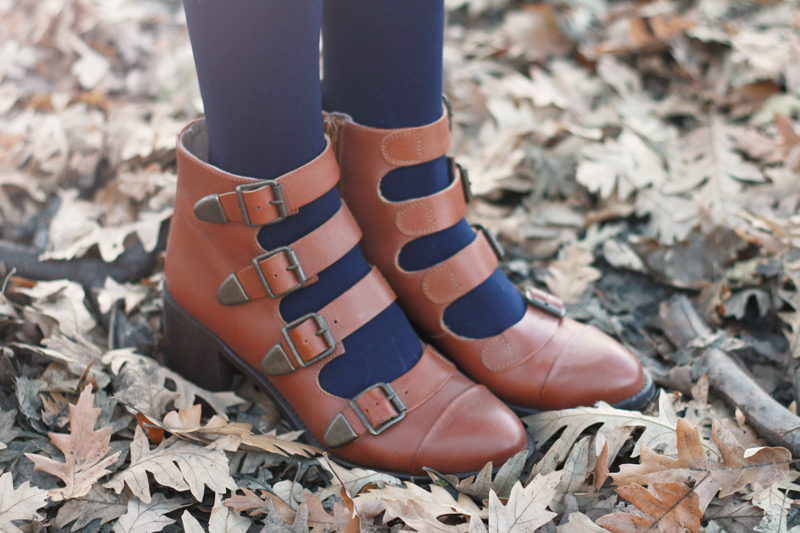 I paired it with a cozy sweater with tassels, vintage Dooney, and strappy leather boots. And believe it or not, the shots of us were taken by my 11 year old sister! Chris is usually the man behind the lens of this blog, he photographs while I edit and pre-process. Anyways, hope everyone is having a wonderful holiday! 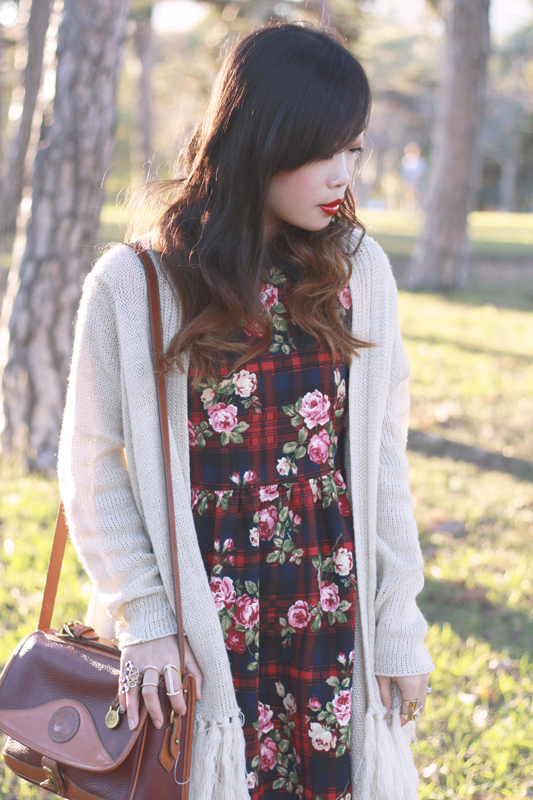 Plaid and floral collar dress by Hearts & Bows c/o Ark. 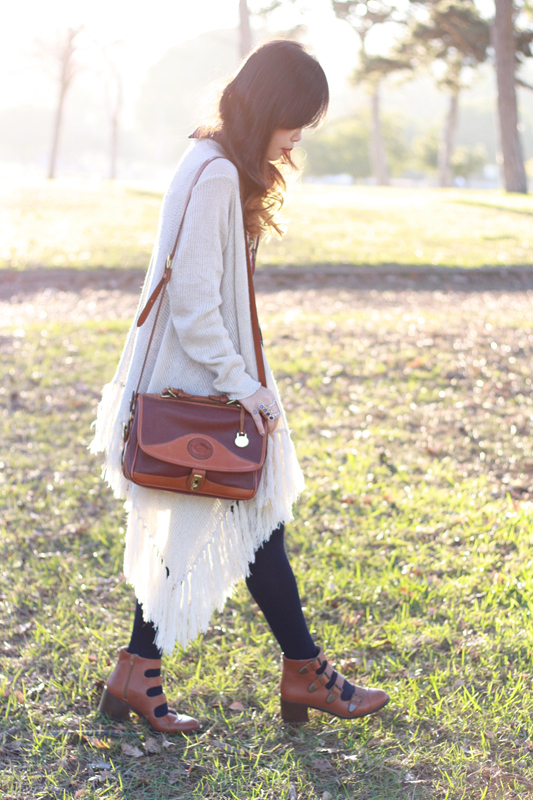 Cream sweater with tassels c/o Sheinside. 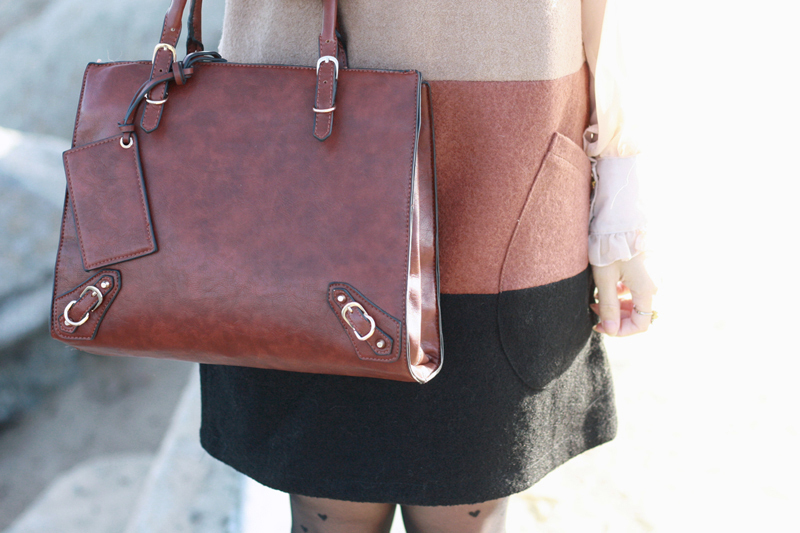 Vintage two tone handbag by Dooney & Bourke. Sometimes photos don't turn out the way I want them to, other times photos turn out better than I would ever imagine. That's life, I suppose. This day, though, everything just fell into place. 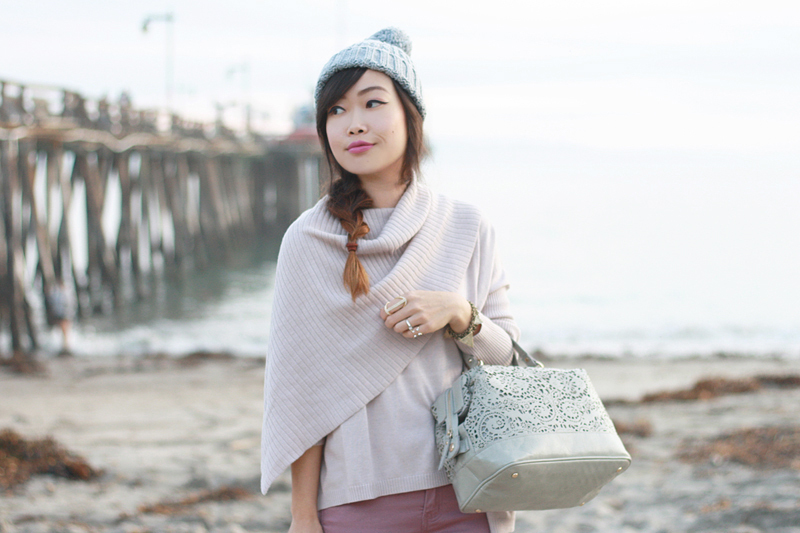 It was impromptu, we caught the last bit of golden hour and the sky was the perfect shade to go with my muted pink and gray outfit. 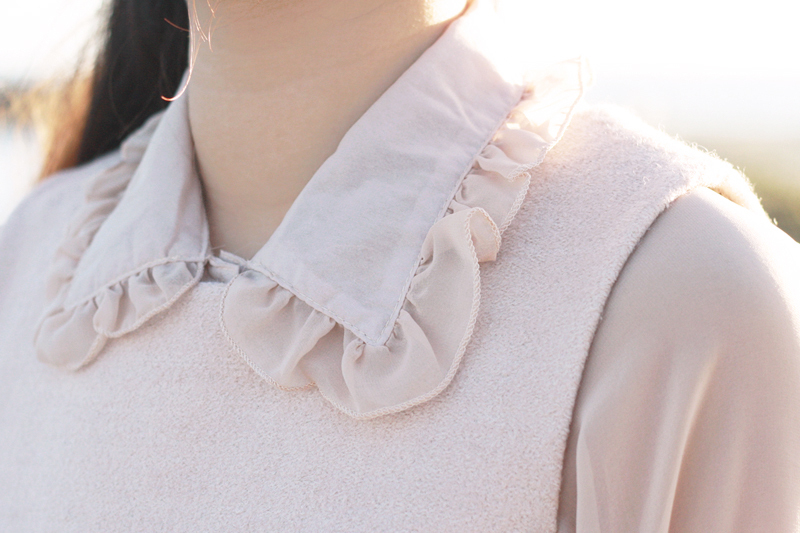 I love the feel of these photographs, they evoke feelings and a sense of memories... things you don't often find in my typical outfit posts. 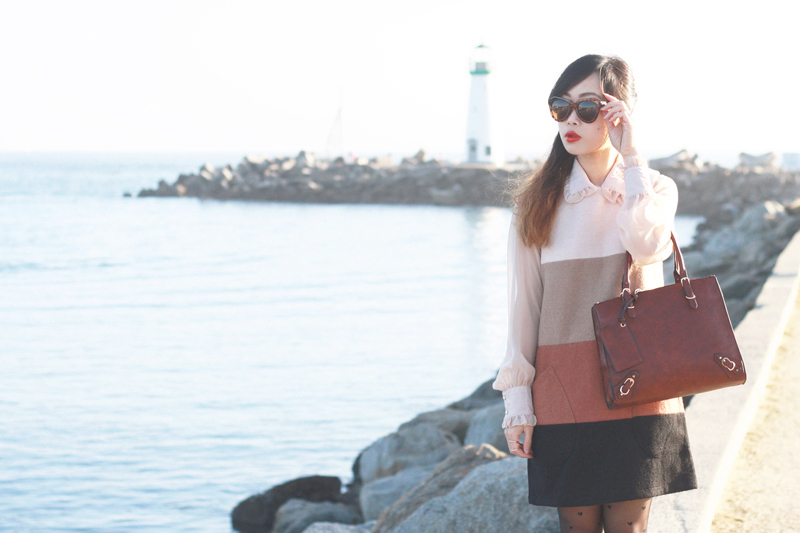 Loomis drape turtleneck sweater c/o Addison. 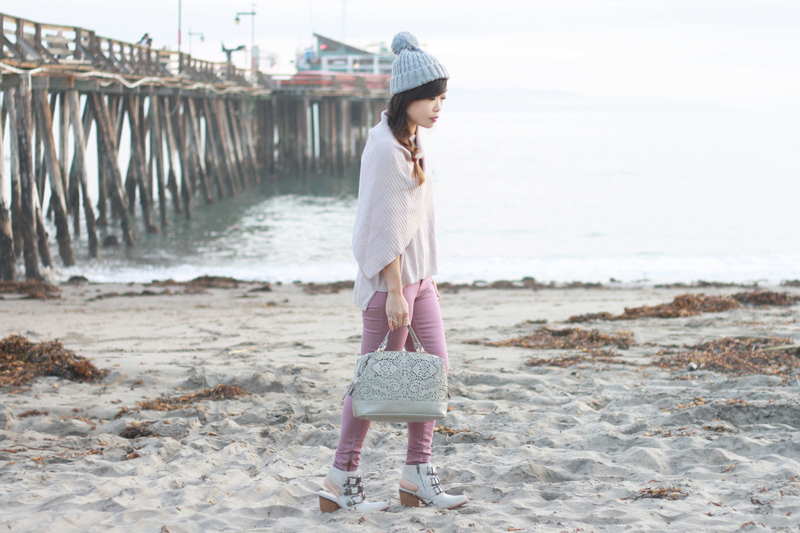 Dusty rose pink zippered skinny from F21. 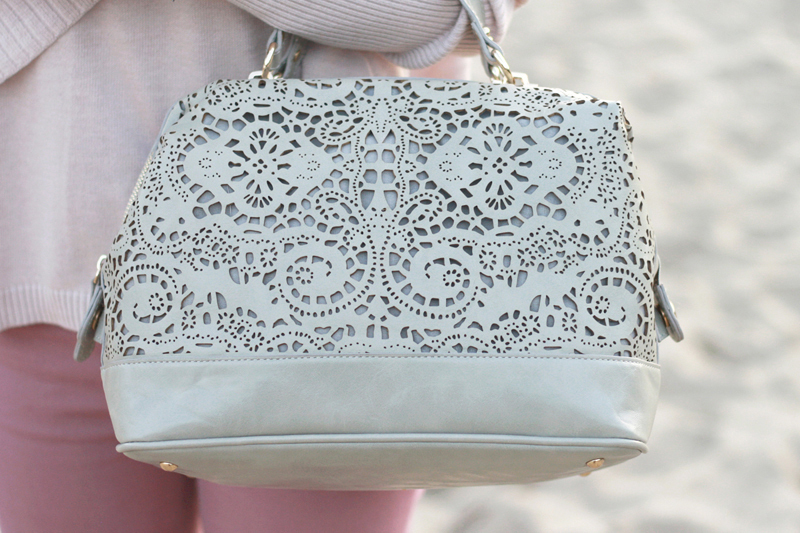 Camille laser cut satchel in chalk grey c/o Sole Society. 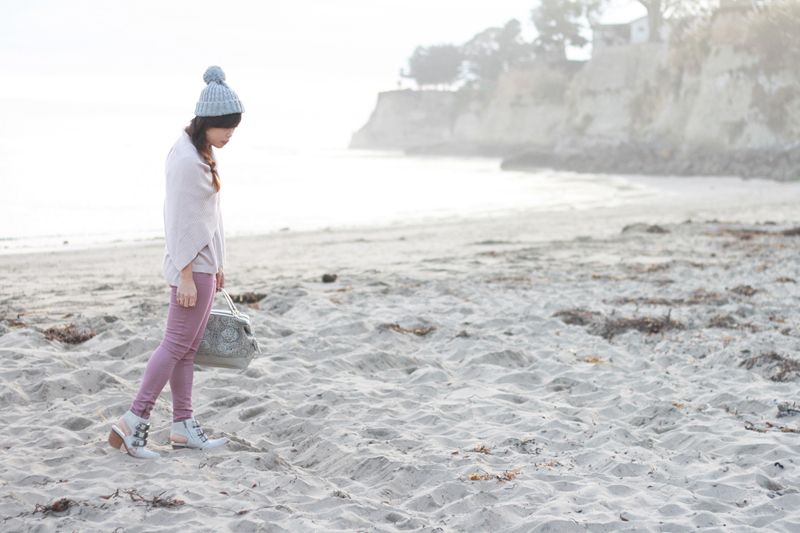 Gray pom pom beanie from F21. I can no longer keep track of how many cat related things are now in my possession, but it doesn't mean it has to stop. Christmas came early with this awesome cat print dress from Nooworks. 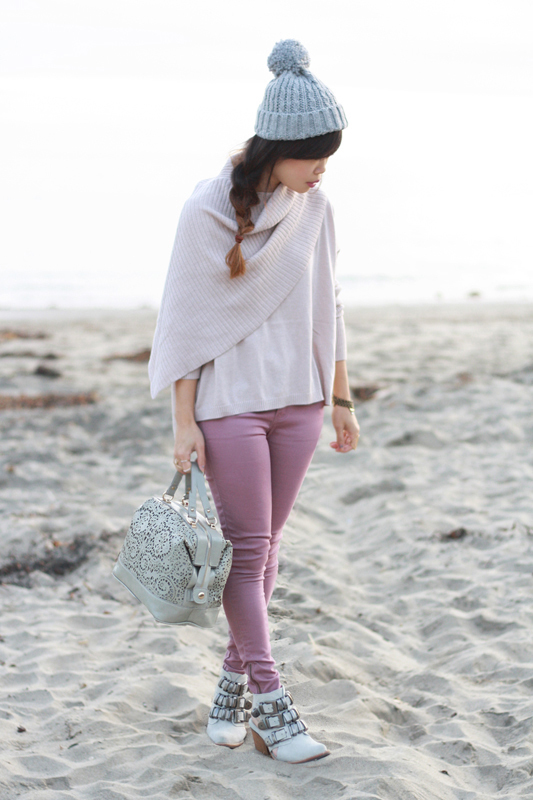 I love its simple linework and the lavender tinted taupe color, not to mention it is perfectly structured as well. I also love that Nooworks is based in San Francisco and that each season they work with artists to create new exciting prints and textiles. I am an artist myself so I definitely have a soft spot when it comes to mixing art and fashion together. 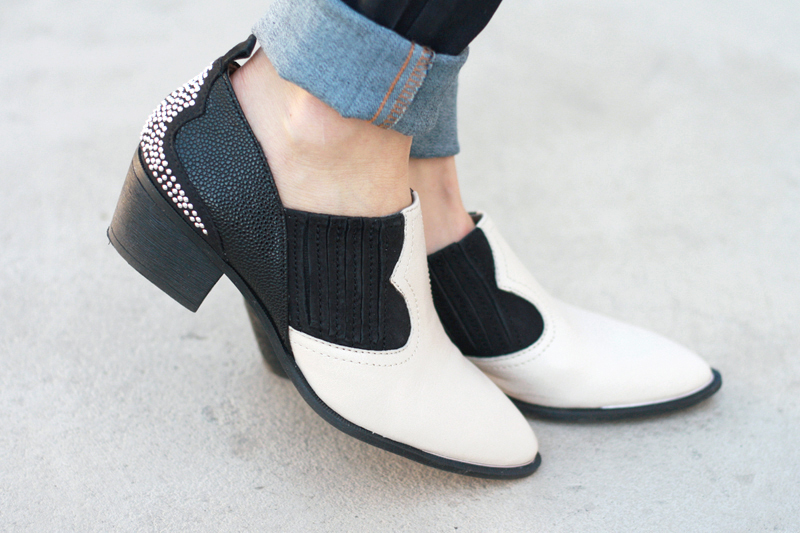 With my outfit, I layered up with a mixed knit sweater and cozy infinity scarf, and of course matching mini tote bag from Sole Society, booties, and lips in the same shade of wine. 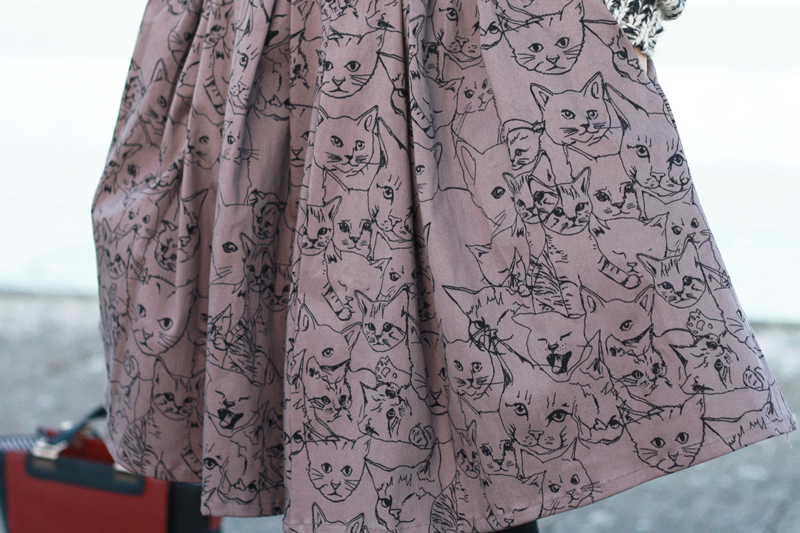 Cat print pleated dress c/o Nooworks. 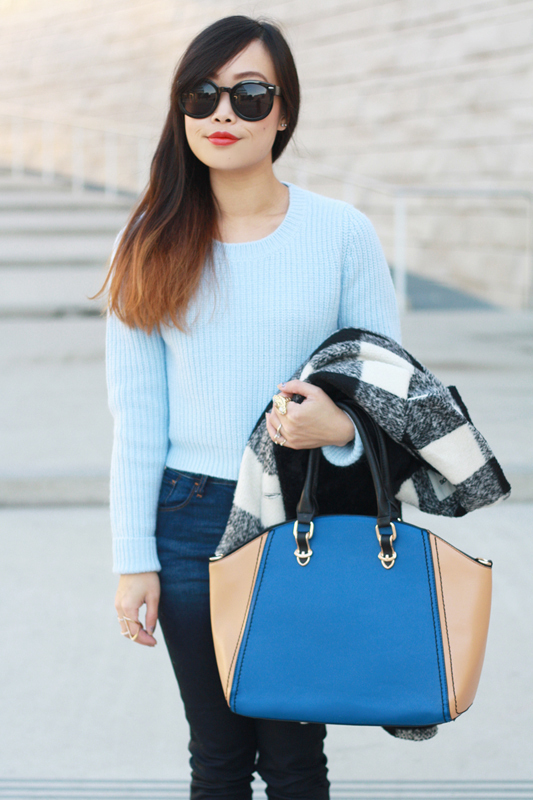 Mixed knit sweater c/o Forever 21. 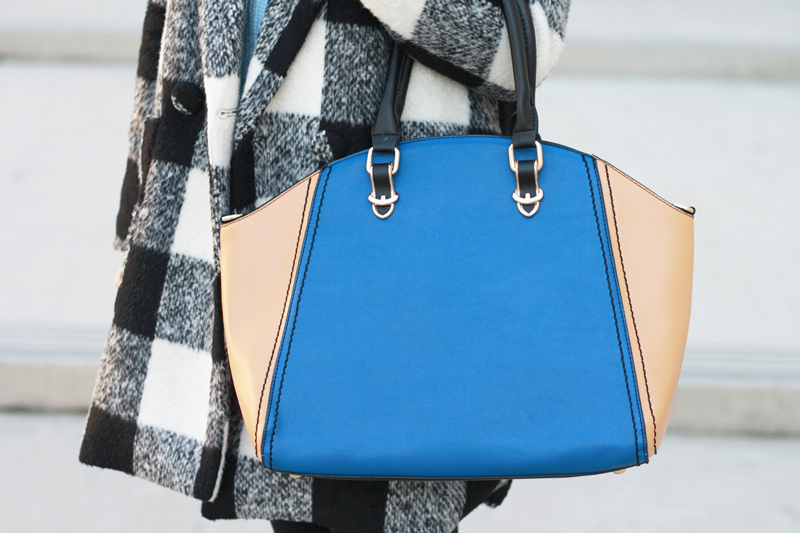 Amaris two tone mini tote bag c/o Sole Society. 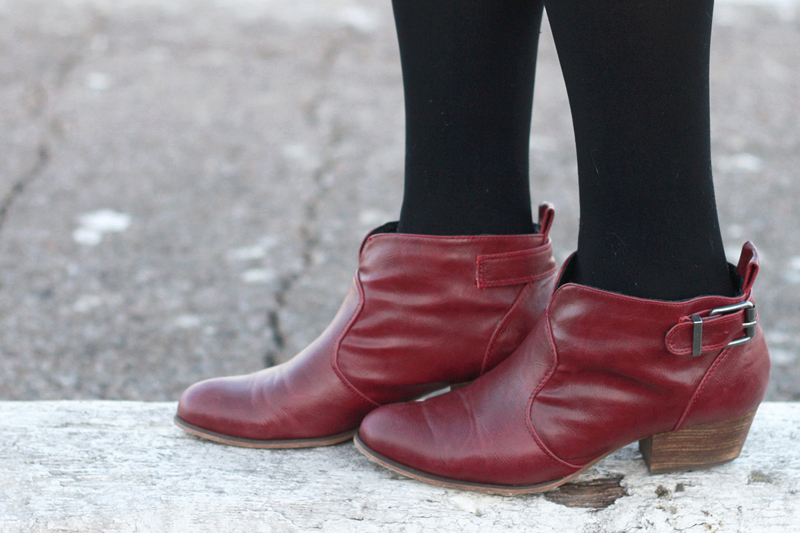 Wine leather booties by Chelsea Crew.